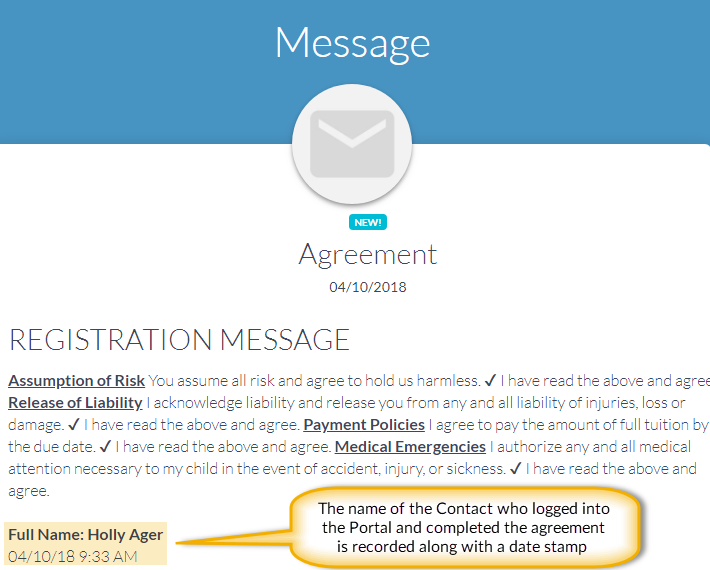 The Parent Portal is a great tool to have your customers agree or re-agree to your legal policies on an annual basis or anytime you have a change to your current policies. You can control the settings that determine when this is needed. Jackrabbit captures your parent's agreement and stores it. Your attorney can advise you as to how often you should update your policies or require new agreements. To set up or edit your policies go to the Tools menu > Online Web Registration and select Agreement Text (Legalese). See our Help article Web Registration Form - Agreement Text (Legalese) for more information. Whenever a NEW customer registers online coming in via the Web Registration Form, your current legal policies are displayed at the bottom of the Reg form and they must agree to each one by checking the boxes and typing their full name, which Jackrabbit stores for you in your database. 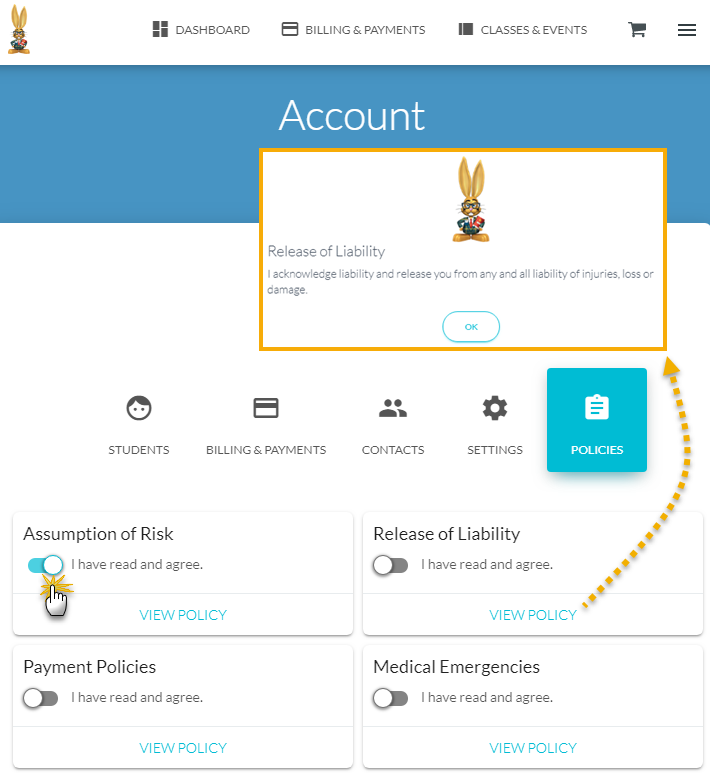 When you first begin with Jackrabbit and have your existing customers imported, you should have them log into their Parent Portal to agree to your policies so that it is captured and stored. When you use the Quick Registration feature, where your staff completes the registration directly in the database, you can require that the customers use the Portal to provide their agreements. If you change your policies or add new policies, you can require all of your customers to renew their agreements in the Portal. To prompt your parents to renew their agreements when they log into their Portal, use the Policies Agreement Date (Tools > Parent Portal > Settings > Family Information). Use the current date or a past date (such as the date you started with Jackrabbit and added your policies into your database, or the last time you edited/changed your policies, or your most recent past annual renewal date such as Jan 1). 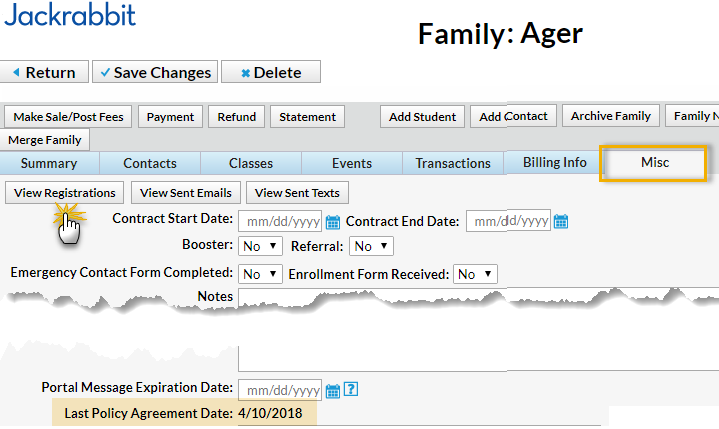 When a date is entered, all families who have not agreed to the policies on or after that date will be prompted to re-agree upon logging into the Parent Portal. Note: If a Future Date is used, all parents entering the Portal will be prompted to re-agree to the policies until that date is reached. 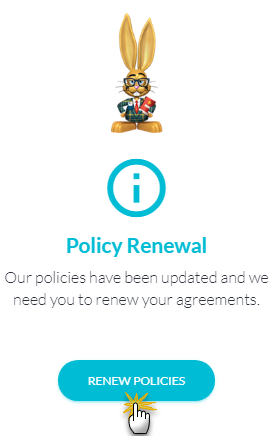 When a parent logs into the Portal and has not agreed since the date entered above (or has never agreed), they will immediately be presented with the Policy Renewal alert that advises them that they need to renew their agreements. When they click Renew Policies they are taken to the Policies tab of their account (this can also be accessed from the Billing & Payments option in the top menu or from the sidebar menu > Account). To view the details of each agreement the parent can click View Policy and a pop up window will display the agreement text. Click OK to close the window and return to the policies. To agree to a policy toggle the I have read and agree button to the right until it is blue. When all policies have been agreed to, a confirmation that the policies are now up to date will briefly display. From the sidebar menu the parent is able to view their agreement from the sidebar menu > Messages. It will have a Subject of Agreement and a Type of Registration. Where can you see the agreements? A notification of the agreement is emailed to both the parent and also to your organization (will be received in the address designated as the the "Reply to" and "Send Alert to" Email Address in your Portal Settings (Tools > Parent Portal > Settings). 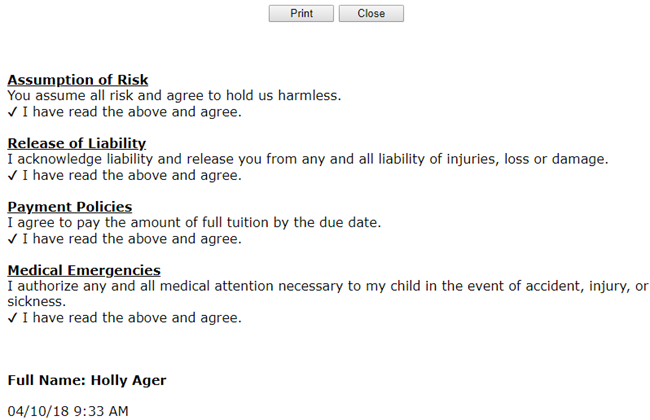 You can also view a parent's agreement in your database. From the Family record > Misc tab, click View Registrations. Locate the agreement and use the View link to see the details. The date of the family's Last Policy Agreement Date is also located in the Family record > Misc tab. The Last Policy Agreement Date can be used to search for, and notify, families who have not agreed to your policies. You can quickly email all families that need to renew their agreements by going to Families > Email Families and using the search criteria Has not agreed to Policies since. Include a link to your Portal in the email to make it easy for the parents to log into their portals and agree. You can also use Families > Search to search for families that have not agreed to the policies, or have not agreed since a certain date. The Parent Portal Log (from the Reports menu) will also list information relating to policy agreements. Our software abides by the Electronic Signatures Act signed in 2000 which considers online submissions binding. Read more about the ESIGN Act in Wikipedia. We recommend that you confirm procedures with your insurance agent and attorney. The email notification with time and date stamp falls under the criteria of this Electronic Signatures Act and allows you to consider Online Registrations and Portal agreements binding. You also have the ability to view and store the time and date stamp for each registration.